A new diplomatic row loomed Monday over the Aquarius as its operators announced the migrant rescue ship was heading to France, only for the French government to say it should dock at the nearest safe port instead. The ship, the only charity-operated rescue boat working in the central Mediterranean, has been repeatedly turned away by Italy and been forced to stop in Malta and Spain after missions in recent months. On Monday SOS Mediterranee, the charity which runs it, said its "only option" after picking up 58 migrants in its latest rescue was to head to the southern French port of Marseille where the NGO is headquartered. "We alerted other countries but we find it hard to imagine that France would refuse, given the humanitarian situation," said Francis Vallat, the head of SOS Mediterranee's French operations. But the French government appeared reluctant to welcome the boat -- which has become a bitter symbol of European divisions over migration -- to dock. France wants the ship to disembark its latest passengers at "the nearest safe port" under "a European solution", the prime minister's office told AFP. The Aquarius is currently near the Libyan coast, about four days from Marseille, according to Vallat. The charity's director Frederic Penard told reporters that 58 migrants were onboard, including 17 women and 18 children. Additional rescue operations might be carried out on the ship's voyage toward France, he added. The charity has refused calls by Italy and others to return the rescued migrants to Libya, saying the country -- riven by conflict between rival armed groups -- is not safe for refugees. French President Emmanuel Macron has previously accused Italy of breaching international maritime law by turning away the Aquarius because the country is the closest to areas where the boat operates. He was criticised at home for not offering safe haven to the Aquarius after it first became stranded in June, although France eventually offered asylum to about 80 rescued migrants. His centrist government passed a controversial immigration law in August which it insists strikes a balance between granting faster asylum while allowing faster deportation of those rejected as "economic" migrants. Italy's far-right Interior Minister Matteo Salvini accuses the Aquarius of offering a "taxi service" to Europe for migrants in Libya and has said it is permanently barred from Italian ports. SOS Mediterranee and fellow charity Doctors without Borders (MSF), which operate the boat jointly, suffered a major setback Saturday when Panama said it would stop allowing the Aquarius to fly its flag at sea. The decision came after Gibraltar withdrew authorisation for the Aquarius to use its flag in August, potentially leaving the boat stuck in legal limbo. "We risk losing our Panama flag as soon as we reach land," Penard said. Panama launched "an official revocation procedure" after Italian authorities complained the Aquarius's captain had "refused to return migrants and refugees back to their point of origin". Mediterranee's Vallat said the pressure put on Panama by Italy was "unprecedented" and called on Panamanian authorities to reconsider their decision, or for European nations to register the Aquarius and provide a flag. "We do not want to stop and we will not give in to force or coercion," he said. Between January and July, more than 58,000 asylum seekers and migrants reached Europe's shores after crossing the Mediterranean Sea -- 41 percent fewer than during the same period in 2017, according to the United Nations High Commissioner for Refugees (UNHCR). At least 1,730 people have died trying to make the treacherous crossing in flimsy boats this year, according to the International Organization for Migration. 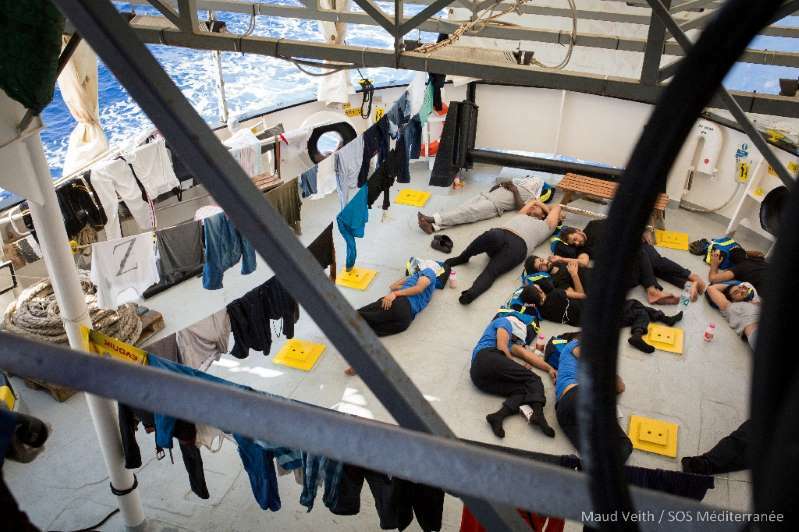 Repeated rows who should take in the Aquarius' rescued migrants have came to symbolise the deep discord in Europe over how to share responsibility for the hundreds of thousands of people landing on European shores since 2015.